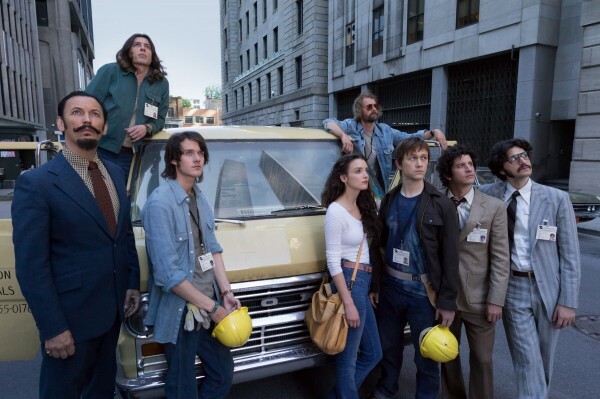 Robert Zemeckis is at it again and I’m not too happy about it. Using the same hand-holding and over-telling approach last seen in his 2012 film “Flight”, the director once again feels the need to hold our hand during “The Walk”. His latest movie actually found me wringing my own sweaty hands during the last 40 minutes. In that sense, he succeeded – because once Zemeckis actually gets to the viscerally suspenseful wire walk across the Twin Towers, the movie becomes an immersive heart attack for the audience. Unfortunately, we have to endure the storytelling choices throughout the movie, which makes for a frustrating and nerve-wracking experience in more ways than one. The biggest mistake Zemeckis starts in the first image we see on the big-screen. It’s a close-up of Joseph Gordon-Levitt‘s face, talking to the audience. Seeing this in 3D IMAX (the preferred viewing method, if you’re intent on seeing this) with a white background is quite jarring and even more jarring than his French accent. It’s not that we’re surprised the actor is there – we know he’s starring as French wire-walker, Phillipe Petit and that the movie will wind up atop the newly-built World Trade Center towers on August 6th, 1974 – it’s just that Zemeckis shoves Gordon-Levitt’s Petit in our faces immediately, invading our space, which is not a good way to introduce a protagonist that we’ll have to follow for the next two hours. But I said that’s where Zemeckis’s biggest mistake starts – he’s not done by a longshot. He then zooms out to reveal that his propped-up Petit, is actually talking to us from the torch of the Statue of Liberty with the Twin Towers in the background. Zemeckis has Gordon-Levit narrate throughout the entire film with his cartoonish accent, cutting back and forth to Petit as he over-explains how he felt during this or that moment and even explaining things as they happen – in case we weren’t paying attention, I guess. It’s a puzzling and wrong decision. With Petit as our space-invading host, we go to the streets of Paris in 1972, where the color palette is curiously black and white with a dash of pale color here and there and the sound of French versions of American rock songs of the day (a tedious Zemeckis staple) can be heard. There’s even street mimes! In other words, this is how Zemeckis envisions France. We meet Petit, a juggling, unicycle-riding street entertainer who takes pride in self-expressionism and soon finds himself fancying the art of balance. 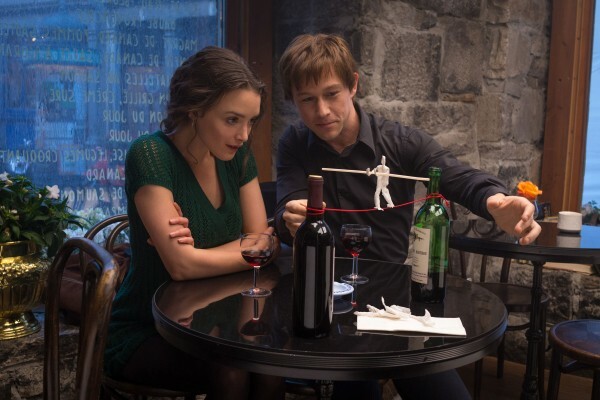 He searches for the perfect place to hang his wire – be it two trees in a park or a street corner, where he woes his eventual girlfriend, art student Annie (Charlotte Le Bon) – when he takes her busking crowd. Petit likes art as long as it’s his art and no one else’s apparently. So, it’s established that Petit is passionate – because the narrator proclaims it over and over – and we can tell with our own eyes that he thinks a lot of himself, yet still has a lot to learn. In other words, he’s determined and arrogant. 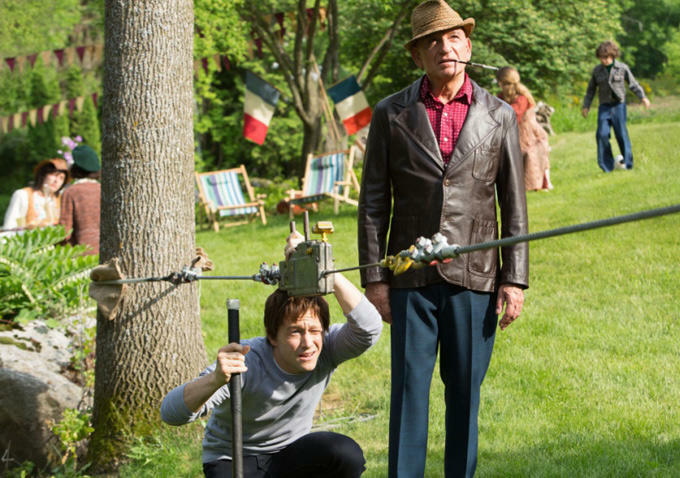 It’s established that he never gives up in the way he hounds his master circus performer, Papa Rudy (Ben Kingsley, of course), to teach him the ways of the walk. But all this time, despite Gordon-Levitt’s enthusiasm and charm, what’s not established is why I should care about this self-centered, egotistical guy. I definitely didn’t want Petit to fail, but I found him to be kind of a jerk. There is without a doubt talent in what he does, that’s obvious, but it’s obvious he is most thrilled at what he does when it is performed illegally in front of a crowd. We see this when he staged a walk between the two Notre Dame cathedral towers in 1971 without permission, which whets his appetite for something even grander. That’s what he finds one day while flipping through a magazine in a dental office, as he sees an article that details what is being built in New York City – twin buildings larger than the Eiffel Tower. He’s sold immediately and his new obsession is found. This is where Zemeckis kicks up the pace a bit as he focuses on Petit’s intense planning of his coup, which essentially builds into a heist once Petit and his crew, er, accomplices make it to Manhattan. That’s right, he somehow persuades photographer, Jean-Louis (Clément Sibony) and his acrophobic friend, Jeff (César Domboy), to join in on his scheme to walk between the newly constructed towers. In New York, the crew learn everything to know about the now-open World Trade Center – what businesses have offices there, which floors are still under construction and when deliveries arrive and leave – accompanied by jaunty jazz from composer Alan Silvestri. Joined by four native New Yorkers – businessman Barry Greenhouse (Steve Valentine), pawn shop owner J.P. (James Badge Dale) and a couple of stoners, Albert (Ben Schwartz) and David (Benedict Samuel) – a date is locked in for the event, but Petit is soon rocked with nerve-racking doubt as they experience setbacks, but his mind is set on accomplishing the impossible and the focus it will take to get him there. Zemeckis co-wrote the screenplay with Christopher Browne (who was part of the crew on the director’s three animated films “The Polar Express”, “A Christmas Carol” and “Beowulf”), which adapts Petit’s autobiography “To Reach the Clouds”, but it’s not the first time his book was adapted to the big screen. 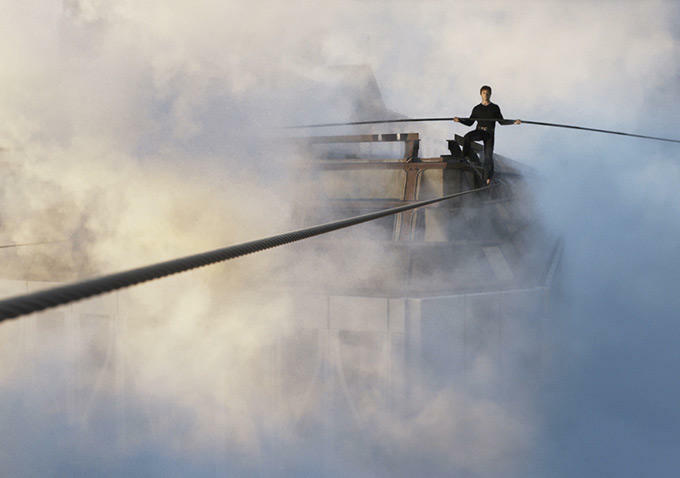 Director James Marsh won an Academy Award for his fascinating 2008 documentary “Man of Wire” which succeeds in a less-is-more style and the goal here was to give Petit’s story a CGI-laden Hollywood treatment, which has a more-is-more style. Having crashed airplanes in both “Cast Away” and “Flight”, Zemeckis knows a thing or two about epic aerial acrobatics. 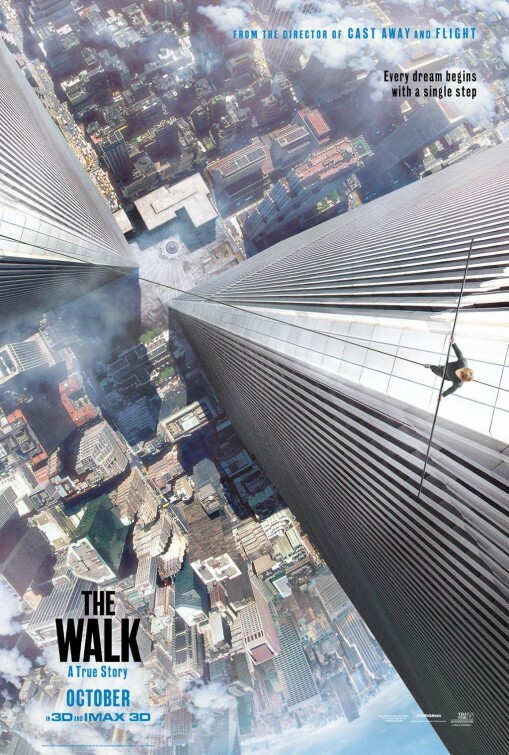 Still, Marsh’s film tells Petit’s story with an intriguing air of mystery, mainly because he relied on showing instead of telling, whereas Zemeckis adds entirely too much talk to a movie that really only excels during its breathtaking final act, where cameras swoop all over Petit while he walks back and forth on his wire – even lays down on it. 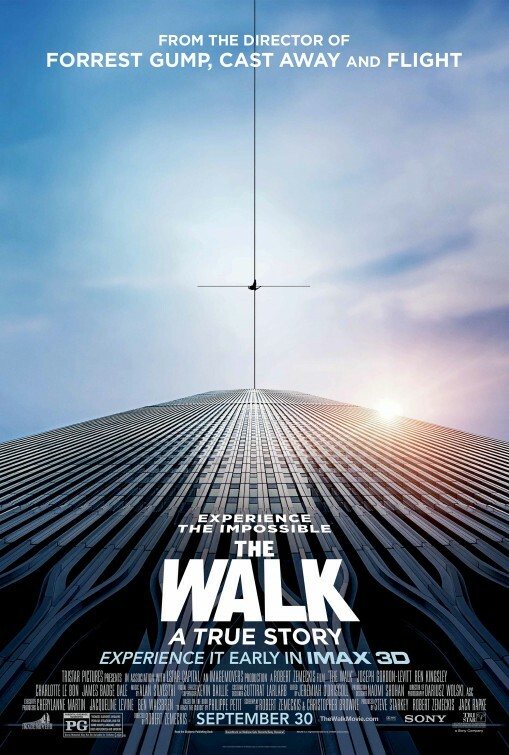 Marsh’s film may be the better film overall, but anyone going into “The Walk” to see the incredible visual effects Zemeckis and his crew deliver (except for a certain bird scene) will not be disappointed. That’s why it’s worth 3D IMAX. Bad the unnecessary narration and this would’ve been a more compelling and absorbing experience. Despite how the storytelling stumbles, Zemeckis displays an impressive show eventually and even attempts a bow of reverence for the Twin Towers in his finale.